I started this whole online teacher journey life about 6 months ago. When I got my first few non real life friend followers on Instagram and FB, I was thrilled. I remember trying so hard to get 50 followers on TPT. My blog was almost non existent. But 6 months later, I am thrilled with how my teacher blogging/TPT journey has grown, but with sooo much room for more great things to come. First and foremost, I've gotten to know so many teachers. I think that has to be the coolest thing! I saw the rally and support we provide each other, when I held a fundraiser for a friend with cancer. I was just a few months in on TPT and Instagram, but over 80 teachers donated to the fundraising bundle! As a big ol' Thank YOU to everyone for being so supportive, I am holding a quick Rafflecopter giveaway. 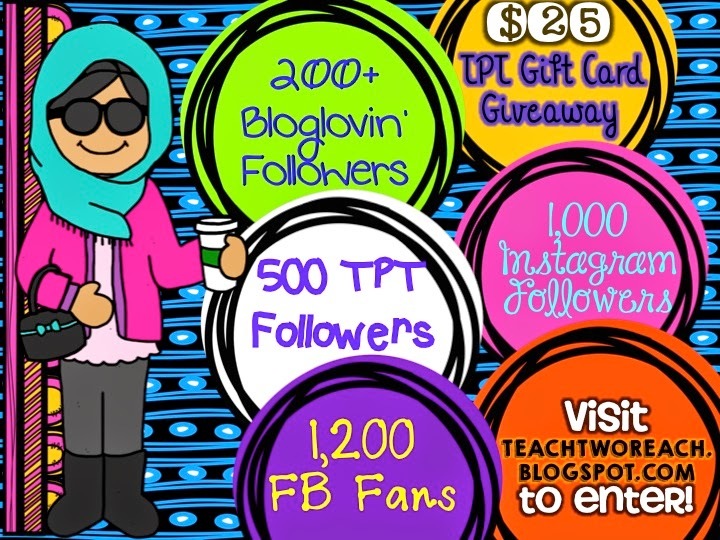 You will get $25 dollars to spend on TPT! I wish I could tell all my school parents to get me that for the end of the year gift...haha. Will TPT barter gift cards for all the body lotion I got? Just enter below and I will pick a winner Monday night! Congratulations! This year we didn't have an end of year as we were out on strike. Yesterday school officially ended. One wonderful gift was baking from one of my little grade 2 girls and her family at the picket site. Hi Charlene! You guys were on strike at the end? Wow, so what happens in that case? School just kind of unofficially ends? Congratulations! I think it's awesome all of you bloggers help friends in need. You all rock! I work at a Title 1 school so I get a lot of Dollar Tree items :). My favorite, and I haven't killed it yet, is a blue orchid that one of the families game me. It's gorgeous (I hope I don't kill it..I tend to do that with indoor plants). Thank you!! lol about the plant because whenever a student gives me a plant, it dies pretty quickly. This year. someone gave me a plant after spring break. so I just made that kid in charge of watering it because I knew I couldn't keep up with it. Congrats!! Just started following you! I also am a second grade teacher. I saw that we are both pinning to the Super Sweet for Second Pinterest board. I would love for you to check out my blog if you get a chance! I will def. come check out your blog!! Thanks so much for stopping by. Congratulations! My favorite I gave to kids was a stay cool in summer with freezer pops. My favorite with parent helpers was thanks for lending a hand with lotion and soap. My favorite I received is an orchid and I made a keepsake book out of all the love my teacher notes and pictures! Good idea about making a keepsake book because I never know what to do with all the letters and cards I get from students all year long! I could even probably just get an album and put them in there. Thanks for the idea! Basket of coffee supplies and mug filled with chocolate that came with an adorable handwritten child made card. omg that would have been my favorite too!! I love the starbucks giftcard I got this year. Congrats! My favorite gift to give is a CD of all the photos I take each year. They are so excited to see how much they've changed and look back at all we have done together! I must remember to try to keep track of all my photos of the year and do a CD. How precious would that be. Thanks so much for the idea. Congrats!! My favorite end of the year gift is anything from the heart. Working at an inner city school I am lucky to get anything. :) so sweet. anything IS lovely. My favorite gift was a$25 Starbucks gift card. And all the drawings the kiddos did for me telling me how much they love me. I got one too!!! cannnnnot wait to use it this summer. Hey lisa!! lol yea lotion won't be in shortage for a long while. That is amazing!!! I still have a flower pot that my student teaching class made for me 7 years ago with a message in it and flowers made out of pens. My favorite to give is books. Sometimes that book is the only one in the house. My favorite to receive is a half eaten candy bar. I was upset the day before and the student gave me the candy bar the next day. I came from the heart since this is all that he had to give. I got each child a book this year too. Something gender neutral and they all loved it. And that candy bar story is sooo sweet...you will cherish that forever. Nice job increasing all your stats. We don't really do end of year gifts, but my favorite end of year gift was a very nice ID holder. It was red leather with a ladybug and clover and my initials. And some crystals. Have worn it every day since! Don't you love getting something you can use all the time!! My school doesn't get a lot of end of year gifts, but I got a gift card to Target once that I was thrilled with! I did also get a super heartfelt thank you card from a parent that was nice! One of my favorite gifts is a letter from a parent I got 7 years ago. I still remember it because it meant so much. Thanks for stopping by,. I love your blog AND all the fabulous things you share! My favorite end of year gift was a bundle of summer goodies -- beach towel, magazines and sunscreen. And they've already been put to good use! love stuff that can come to good use. Thanks so much for coming by Leah! You are awesome. My favorite end of the year gift was a personalized desk block/name set. The mom was so creative. :) Also, the IG link was broken in the rafflecopter. It was trying to go to a "page not found". Easy to just copy/paste the blog name in though. thanks for telling me that! I'm not sure if I actually got it to be fixed though..lol. bleh..me and technology are not the best of friends. My favorite end of year gift was a coffee mug filled with chocolate! Still have & use mug, chocolate was gone quickly. My favorite gift was a cute little purse filled with two gift cards! Favorite gift - Visa gift card! So generous! Thank YOU for a great giveaway. I am super excited about my giftcards too. I'll probably spend them on groceries.. :) Good luck on the giveaway! This past year I taught at West Elementary in West, Tx. It's a little town where everyone is Czech! How cool is that!! Can you speak the language?? I don't really get too many gifts, but i was totally surprised by a gift card to Barnes & Noble this year from one of my students!! Awesome gift. awesome! plus 20 percent teacher discount and you get more for your buck! Congratulations! One of my favorites is a gift card to Staples which I will be using in August to help get my room ready for back to school. lol can't wait for those back to school staples and office depot fliers! Congrats on your huge milestones Amna! Here's to many, many more to come!!! Hi elyse! happy you stopped by! love the superwoman cape card gift..so sweet! My favorite End-Of-Year gift this year was a fingerprint tree made from the kids in my class. My second favorite gifts are always Starbucks or Target gift cards! Can't ever have enough coffee or shopping!! Congrats on reaching so many milestones, Amna!!! My favourite end-of-year gifts to get are always gift cards...David's Tea, Tim Horton's, Starbucks (i.e., caffeine-inspired =D )!!! I also especially like the cards the kidlettes make me...that always warms my heart <3. Thank you for your generosity and for considering me =). leafsgirl@rogers.com. Not a school teacher at the moment... But we gave my daughter's class teacher a keepsake memory book and a Pinterest-inspired present! my summer goal is to organize my pinterest and my pinterest projects!! thanks for stopping by. I second the barter system for lotions! Congratulations on your success, with many more to come! Love your blog, Thank you for the chance! Congrats on your blog! My favorite end of the year gift was a knock-out rose bush. Beautiful! Congratulations on so many milestones! Walking those kiddos out the door on the last day was my gift. I teach in a high poverty school and it's very unusual for us to receive any kind of gift at any time of the year. Congratulations on your wonderful success in such a short time. I have been retired for 8 years now, but I own a small tutoring business. I received a gift card to Subway, and my husband and I really enjoyed that. I am having so much fun this summer finding free materials to send in to my office for my tutors to use with my students. Unfortunately, I have cancer and am going through radiation :(, so I am not tutoring, but want to stay involved. Thanks for your great giveaway. My students telling me they werent excited for summer because they wouldnt get to see me! No better gift! My favourite gift was an insulated cup that I have been using non-stop since Friday. I've filled it with mint, ice and a pinch of lemonade powder. Mmmmmmm! My favorite end of year gift was a bamboo plant one of my students gave me!! I love having plants and they say bamboos bring good luck sooooo I really hope to win :) Thanks for this great opportunity and congrats on your milestones! I only received one gift this past year. It was a notepad holder in my favorite color (turquoise) with rhinestones! It has a little pen holder on the side. It was very thoughtful, as I didn't expect anything, as I teach in a 83% free/reduced lunch building. It's even more special to me, because it came from a sweet, sweet student. I saw her less than a week after school let out, because of very sad circumstances. Her father was murdered :( I just held onto that sweet girl as she sobbed. Ugh, awful! One of my kiddos mom is a photographer ~ she gave us a free sitting! With rights to the digital pics and everything!!! Best.Gift.Ever!! I appreciate anything from the families from my school, but I did LOVE the 2 Starbucks coffee gift cards I received. My students know I LOVE coffee! My Starbucks and Target gift cards are always some of my favorites! I didn't get any end of year gifts. I am a Reading specialist and sometimes only have students for a few months of the year. Also, my school has a lot of families that are very poor. So, my favorite gifts were hugs from students and promises to keep reading over the summer. Sending my first graders off for a great summer and knowing I will see them in September as 2nd graders - that is the best end of the year gift :) Michele B.
I got a gorgeous bouquet of flowers from one of my students! Very sweet! My favorites were some cartoons drawing my students made! They were so cute! Thanks for a great giveaway! Favorite stuff - lotions, potions, and soaps! Always nice to get something. :) Thanks for hosting this giveaway Amna! I got a Thirty-One bag with my last name embroidered on it. Who doesn't love Thirty-One?! Congrats to you. Thank you for a chance to win! My favorite gifts are those that the kids shop for themselves. Sometimes funny! Always happy to receive any gifts from students. It's nice that they think of us. Favorites are certainly the gift cards. Thank you!